From renovated hotels to new tasting rooms, an array of very different hospitality projects have recently been completed in Northern California by design firms around the country. There’s a grand public space, a luxurious 5,000-square-foot hotel suite, a reimagined century-old city hotel, a wine-country retreat, and a retro-chic tasting room. With styles ranging from waterfront industrial to neo-Victorian, here are six inspired projects worth noting. Details: The 11-room Mansion was built in 1885 as a private residence, then converted in 1906 to a hotel which grew into its current total of 63 rooms. 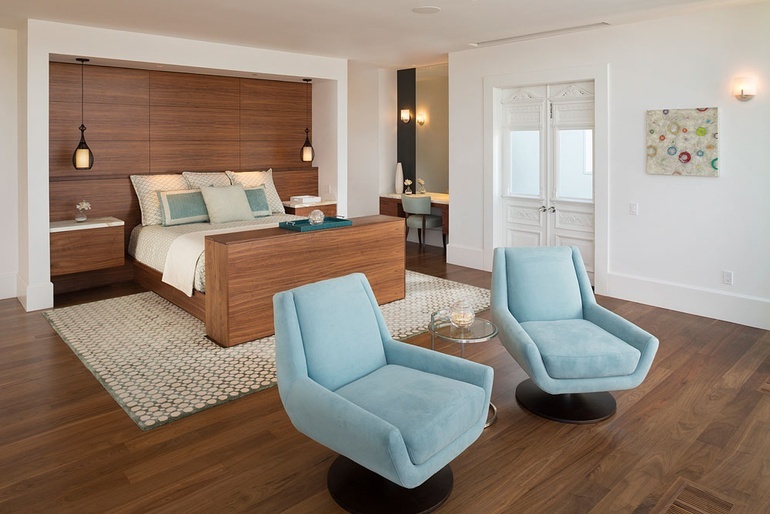 Post-renovation, historic details meet contemporary luxury, and the Mansion includes nine rooms and suites designed by Vermont-based TruexCullins, plus the exclusive two-bedroom Alexandrite Suite designed by San Diego-based Christopher O’Connor Design. In addition, TruexCullins renovated seven Hillside Cottages, some of which have full kitchens and bay views. Standout: The 5,000-square-foot Alexandrite Suite boasts hardwood floors and a soothing blue, green and white palette in its wide-open living, dining and kitchen areas. Focal points are the striking Turkish marble fireplace, nine-panel media wall, and floor-to-ceiling foldaway windows connecting the suite to a landscaped, two-tiered terrace overlooking Richardson Bay. Details: Located on Geary Street near Union Square, the circa-1908 building had already undergone a number of previous renovations when designer Hun Aw opted to “honor the building’s bones” via a predominantly subtractive design process. The result “feels as if it’s evolved organically,” says Aw. An original cast-iron staircase in the guest corridor was sandblasted and sealed, while the lobby features circa-1908 hexagonal floor tiles (with plenty of cement patches). The Art Deco exterior was refreshed to resemble a 1930s postcard. Standout: The early 20th and 21st centuries merge in 153 rooms. Original concrete or hardwood floors are softened by tufted headboards, handwoven rugs, restored Victorian settees and school house chairs, touches of vintage wallpaper and billowy white curtains. Bathrooms feature white marble or tile showers with retro walnut-frame mirrors. Details: Designed to replace the outdated terminal at Pier 35 and slated for completion later this month, the 88,000-square-foot, two-level Pier 27 Cruise Ship Terminal is LEED certified and will serve as the city’s primary berth for departing and arriving passenger ships, as well as a venue for conferences and events. It will also feature a 2.5-acre waterfront plaza with a lawn, benches and planters. Standout: The second-floor embarkation hall features exposed steel beams and ducts as well as 360-degree views of San Francisco Bay. The interiors are awash in tones of gray and silver with blue 3form accents, carpet tile patterned to complement the architecture, and American Seating stackable chairs used during embarkation. Details: Over the past few years, Napa's downtown has developed an urban wine trail dotted with almost two-dozen tasting rooms operated by local wineries. One of the newest, Capp Heritage Vineyards is also one of the most distinctive, delivering a 1,500-square-foot Art Deco-meets-Victorian ambience that saturates visitors with design from two distinct eras accented with stunning furnishings, lighting and artwork. Standout: The winery's owners masterminded a restored mahogany and brass bar from Napa’s Noyes Mansion plus an array of Victorian furniture in the hunter-green “1880s Room.” The purple-and-mauve “Deco Lounge” features a 10-foot-diameter domed Tiffany-glass ceiling lamp from 1910, a circa-1925 bronze Deco sculpture from the old Hollywood Hotel in Los Angeles, curved ivory and black leather armchairs and a contemporary copper fireplace. Details: Formerly known as La Residence, this now 41-room resort is slated to reopen this month as Senza following a gut renovation of 15 existing guest rooms (with the exception of those in the historic Parker Mansion, which were renovated in 2013) and the addition of 18 new rooms and suites. The transformation from a cozy traditional look to a clean, contemporary aesthetic is a dramatic one. Standout: The 18 new luxury suites measure 500 square feet and are sprinkled throughout three new buildings, which have a muted gray color palette extending from the polished-concrete floor to the vaulted ceilings on the second floor. The focal wall features a gas fireplace with a black-metal surround and planks of rough-hewn reclaimed cedar. Bathrooms have heated continuous pebble flooring, a glass-enclosed shower and a Kohler deep-soaking tub. Details: The new 12,500-square-foot, two-level tasting room and hospitality center (including Cucina di Rosa, a tasting bar and cafe offering panini and salads) comprises one-third of the winery’s landmarked Redwood Cellar. The design maintains the historical integrity of the 1872 building while creating a signature style within an architecturally unique space. Standout: In the tasting room, the designers constucted walls out of reclaimed redwood, taken from 1940s wine tanks built by Cesare Mondavi. Complemented by contemporary concrete flooring and other walls in glass and cement, the design represents the Mondavi family heritage (Krug is part of the C. Mondavi & Family of vineyards) with an ambience that is timeless—not old.